Ever get the feeling you’d like to be a foundation? Like the Rockefeller Foundation or the Ford Foundation? Not just to have all that money to throw around, but to actually do something good with it, accomplish something, something tangible. 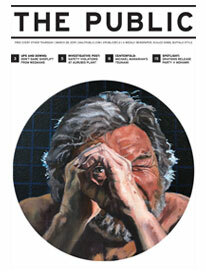 Like fund individual artists’ residencies and associated art projects. Tina Dillman isn’t rich. 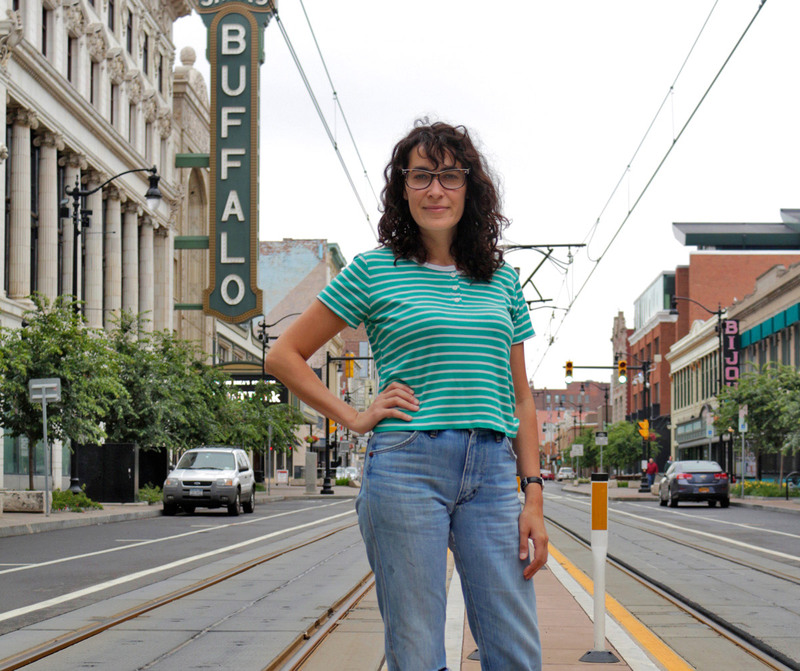 She just got out of school, with an MFA degree and substantial school debt, and moved to Buffalo from San Francisco—partly because it’s so much cheaper to live here, but more because when she visited she saw so much going on, in the arts, in the whole city revitalization, the ferment—and has started her own artists’ residency program. On a shoestring or less. Out of her own residence. A house she rents on Grant Street. The residency program is called Project Grant. The current program season is in three parts. The fruits of the first part—artwork of aspiring kid artists following free instructions by Project Grant artists at a West Side park on consecutive Saturdays last month—are currently on display at Buffalo Arts Studio. Part two—currently underway—includes free art instruction at the Old First Ward Community Center. The instructees’ work will be unveiled at the City of Night festival—being held in the Old First Ward this year—July 18. Part three will be a performance work, tentatively set for early September. Still somewhat in the planning stage. So that after finishing her undergraduate program, instead of making and trying to sell paintings, she got working with youth groups. Then a variety of art non-profits, first in Providence, Rhode Island, and then San Francisco. And eventually started her own art space in San Francisco, out of her house. “We did everything,” she said, “visual art, poetry, music, film, even a performance art dinner by a traveling chef.” Next, her MFA from the San Francisco Art Institute. Following which she won her own grant for a residency in Los Angeles. But a family emergency brought her back to Central New York, where she had grown up and family still resided. The family emergency became protracted and she had to give up the LA gig. But meanwhile visited Buffalo on several occasions—she has relatives here, too—and realized this was the place for her and her evolving idea about what would become Project Grant. So how is Project Grant funded? By Dillman herself, for the most part. She works several part-time jobs—as a program coordinator at Squeaky Wheel and putting together the art listings every week for The Public—to keep herself and the program going. In addition to lots of Project Grant sweat equity. “I wear all the hats,” she says, “program director, marketer, outreach coordinator, fundraiser…” The list goes on. Also by some money donations—mostly quite modest—from individuals of good will, and supplies donations from Hyatt’s art store and Golden Artists Colors (a manufacturer of artists’ paints sold at Hyatt’s and elsewhere). Participants in the various instruction programs also get free supplies. The residency artists who worked on the West Side project were Hope Mora, a photographer and other media artist originally from Pecos, Texas, now living in Buffalo, who taught about still life painting; Christine Heller, a mural painter currently living in Cooperstown, New York, who taught about murals; and Jenna North, currently living in Utica, NY, who taught about abstract art. Erik Parra a painter and collage artist from San Francisco is the instructor for the Old First Ward sessions. Kyla Kegler, originally from Buffalo, now living in Berlin, Germany, will be the part three performance artist.